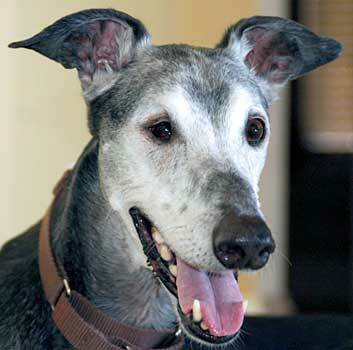 Comet became a member of GALT's family when he was found as a stray in the Dallas area. We know from Comet's ear tattoos that he was born February 22, 1994 in a litter that was sired by V V County Barn and dam P's Brightside. Black, with that oh-so-sweet gray face, Comet is blind in his right eye. His past remains a mystery but his future as a loving pet is certain. A wonderful senior gentleman, Comet is ready to streak into the home he so richly deserves. It is not known at this time if Comet is small animal or cat tolerant.